The seating are of the restaurant is very small, seating perhaps 30 at most, but it is comfortable enough and very bright and clean. Unfortunately, at least for my personal taste, it is counter service only and customers must place and pick up their orders from the counter staff. One is also requested to carry one’s own used dishes and trays to the counter once finished. I didn’t mind this too much, however, and the young man who was running the counter was very friendly. His English was a bit limited but he was obviously working hard to be helpful and did a good job. The menu leans heavily to sushi, as one would expect, but there are a lot of other interesting small dish selections as well. 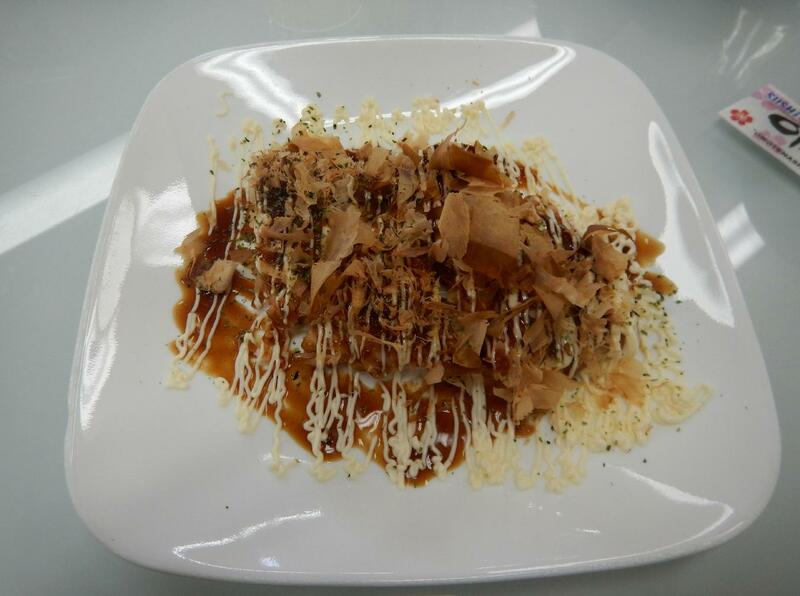 One I would like to have tried was Takoyaki but I had no room after sampling the other items I wanted. Surprisingly for such a small ‘take-out’ place, there is a liquor license and I was able to enjoy a flask of hot Sake at the beginning of my meal. Tuna Nigiri – This is pretty much a standard in any Japanese restaurant and they did a fairly good job here. 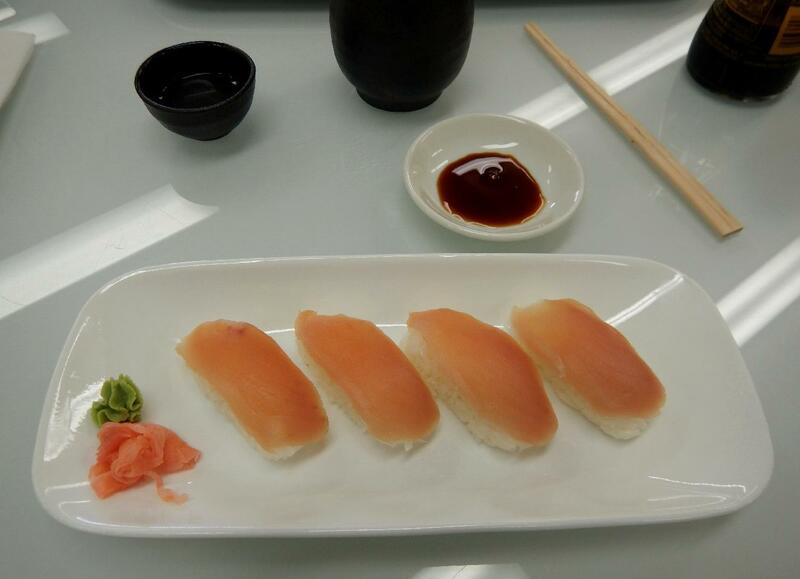 The nigiri was nicely formed and the tuna fresh, if cut just a little bit too thinly. I have had better but this was still quite respectable and I gave it a 3 out of 5. 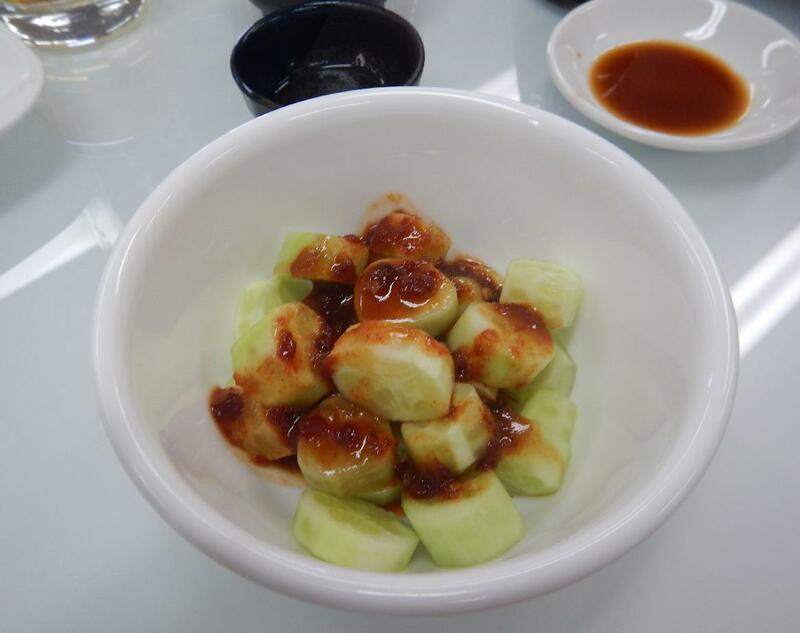 Spicy Cucumber – This was a little different than the usual offering in that the cucumber slices were peeled, cut very thickly, and only lightly squeezed after salting. The dressing was sesame and chili but there was also a faint marine flavor (Dashi perhaps?) that was very nice. I gave this a 4 out of 5. 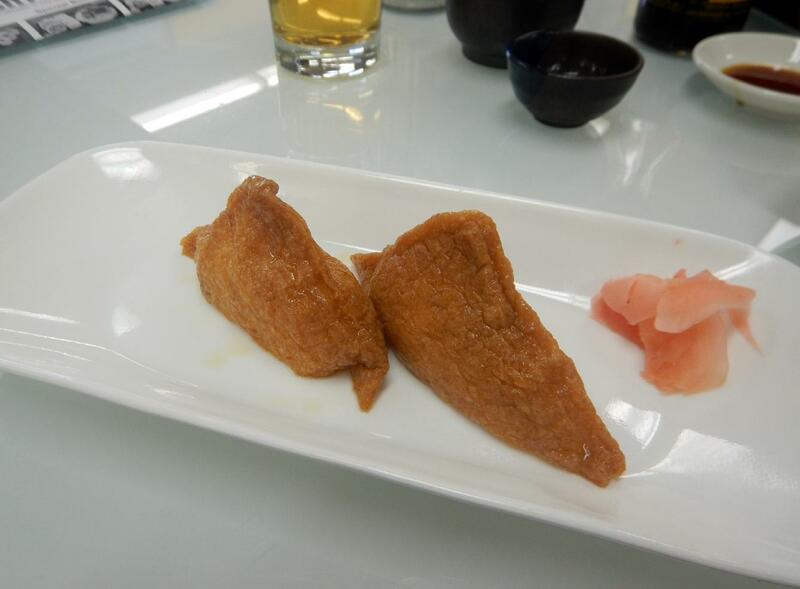 Inari Sushi – This type of sushi consists of the usual rice stuffed into pockets of fried tofu and my only experience with the specialty, until now, has been in my own kitchen. These were served cold, and the wrapper, or pouch, was much thinner and delicate than I have ever been able to manage by myself. The pockets were drizzled with a sweetish sauce and the overall effect was delicious. I gave these a 4 out of 5. 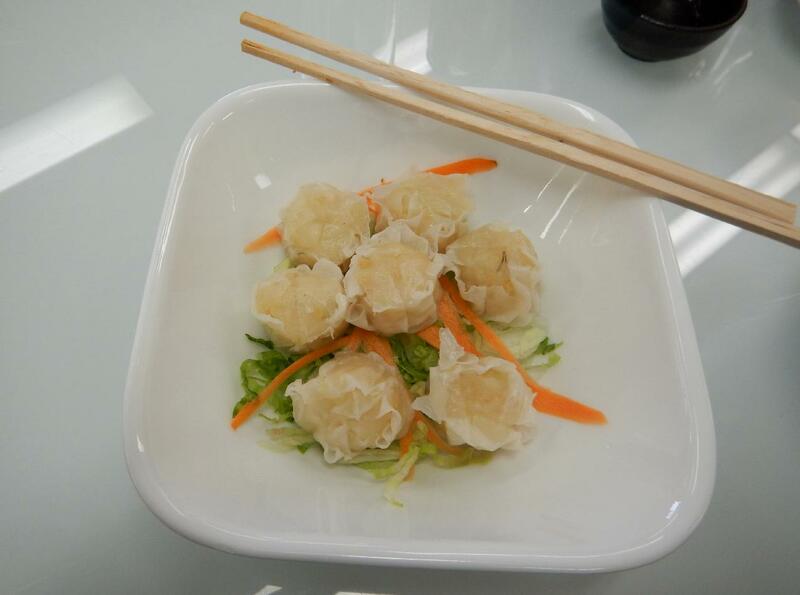 Shu Mai – The menu described these as being ‘Japanese style’ Shu Mai, stuffed with fish and shrimp.. They were quite a bit smaller than would be usual in dim sum restaurants but I rather prefer this size as you can easily pop the whole thing into your mouth in one go. The wrapper was also thinner and more delicate than other varieties and slightly translucent, making me think that a little rice flour may be used in the dough. The filling was subtle but delicious, with more shrimp than fish, and I think that these may be the best Shu Mai I have ever had (including my own). I gave these an unstinting 5 out of 5. Okonomayaki – This is only the second time I have had this ‘Japanese Pizza’ and I have to say that this one was not nearly as good as my first. It looked pretty interesting, with the delicate Bonito flakes fluttering from the heat of the pancake, but the pancake itself was very stodgy and not well cooked. I could taste shrimp and cabbage, along with a faint hint of the powdered seaweed and mayo, but there was little else of interest, either in the flavor or texture. It was the only real disappointment in this whole meal and I gave the selection 2 out of 5. 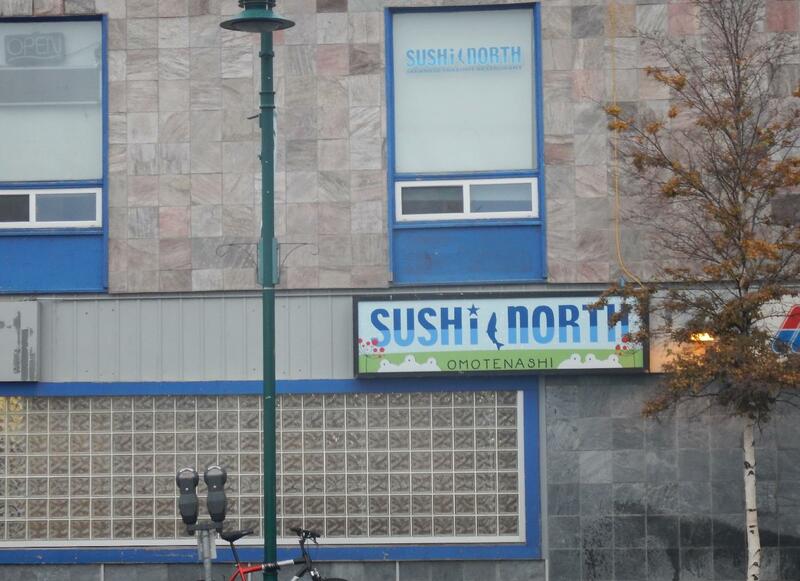 Sushi North turned out to be something of a pleasant surprise. 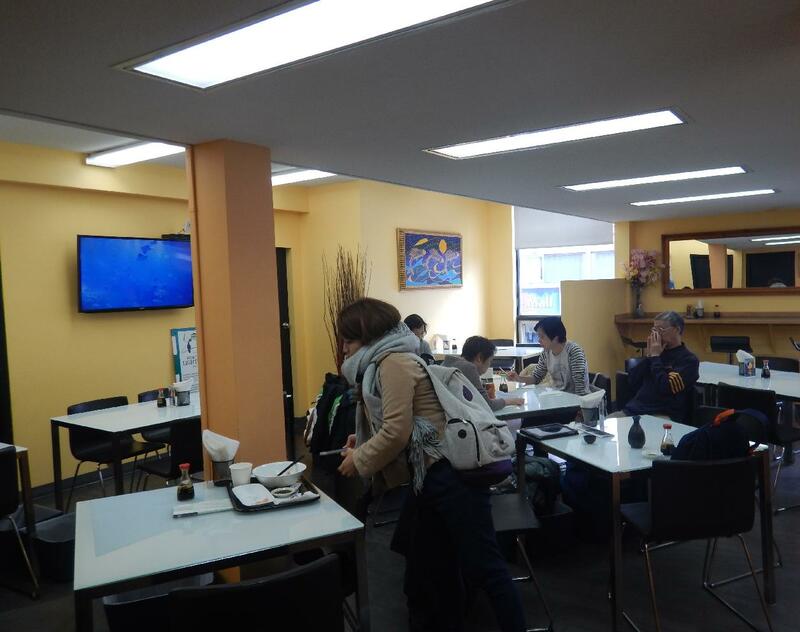 The menu is interesting, the food well-prepared, and the service friendly. Given the price, this is a place well worth visiting. Despite one rather disappointing selection, I felt the establishment rates a 5 out of 5.